View More In Ceiling Lights - Page 4. There is no switch on the main body. Size: Diameter of every body: 4 inch, height 14 inch, Chain length: 23.6 inch (height adjustable). Rectangular Base: 20'' * 2''. Voltage: 110-240V for American standard. Wattage: 3W x 3 LED bulbs included. Material: aluminum, crystal. Installation type: hardwired, not plug in, all accessories included. 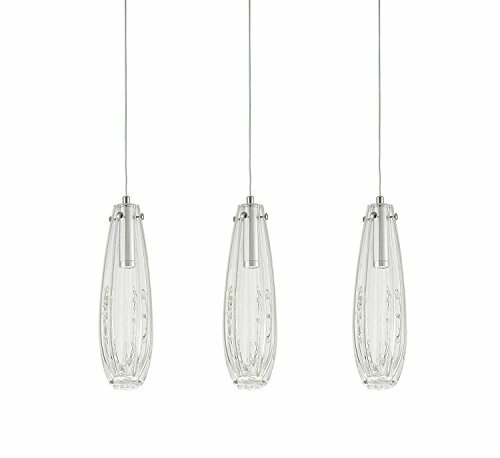 Glossy shade brings a sense of luxury, crystal glass to make the space glamorous. Perfect for kitchen, dining room, bedroom, living room, hallway, home decoration, lobby, restaurant, cafe, bar, club, hotel.